એસક્યુએલ 2017 – Microsoft announced in April 2017 that the next version of SQL Server RDBMS and Business Intelligence software is officially named SQL Server 2017 and made a new Community Technology Preview (CTP) available for download. એસક્યુએલ 2017 – referred to as “SQL Server vNext” has been released in a series of CTPs since late last year. 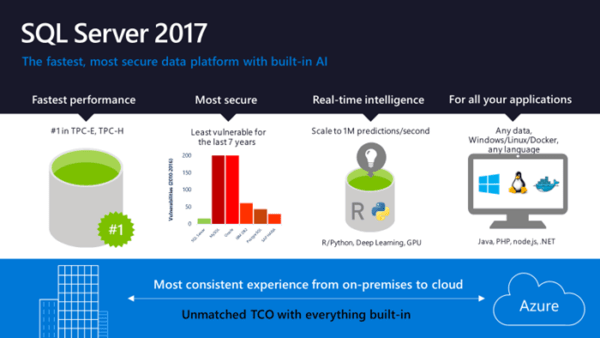 Gain trans-formative insights with up to 1 million predictions per second using built-in Python and R integration, and get end-to-end mobile BI on any platform. This is a key area of extension into the fast growing Data Science, આગાહીયુક્ત પૃથ્થકરણ and Big Data arenas.